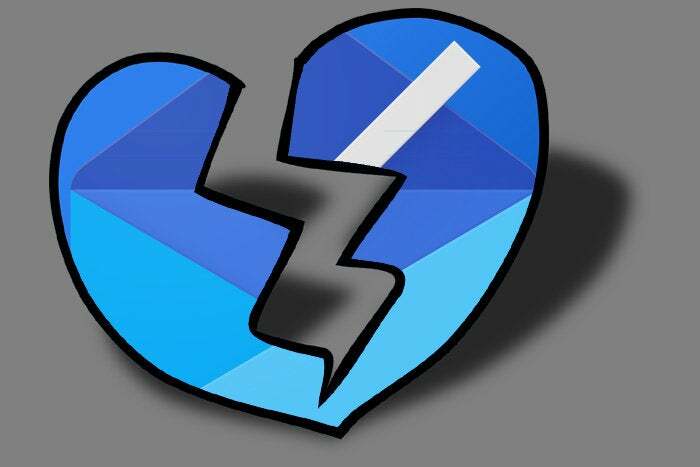 Breakups are never easy, but going from Google's Inbox app back to Gmail doesn't have to be heartbreaking — if you plan your transition wisely. Ah, Inbox. Dear, sweet Inbox. When we first met, I'll be honest: I wasn't so sure about you. But you were intent on winning me over, weren't you? You worked on yourself and got better — stronger, more capable, more confident. Finally, I saw the light. And boy golly, did we make a great pair. We had some good times, the two of us — getting cozy on my desktop at work, staring at each other through my laptop at night, even touching in all sorts of places on my Android phone. (At the risk of being ungentlemanly, let me just say: It was a lovely feeling to know you were always in my pocket.) The past few years are filled with heart-warming memories. But it was never meant to last, was it? I can see now that despite your initial vague assurances to the contrary, you couldn't stay by my side forever. And now, the time has come for us to say our final farewell. You're leaving forever in March, and it's an end that I know is not negotiable. You know what, though, Inbox? I'm not gonna lie to you: I've already kinda moved on. Once I knew you were making plans to leave me, I started flirting with my old flame — that sturdy ol' gal named Gmail — once again. It felt foreign and almost wrong to be back in Gmail's embrace at first, but we've been working on that. And now, I feel like Gmail and I were never even apart. It still makes me sad that you're leaving — and that so many of your clever ideas will be left behind with your departure — but at a certain point, all a fella can do is accept that reality and find a way to charge forward. I know I'm not the only one who had this sort of relationship with Inbox — and as the app's official departure date grows depressingly near and Google nudges us more and more to move on, it's time for us all to pack up our memories, clean up our belongings, and prepare for a post-Inbox email life. The good news: I've been through this already, and I'm here to help. I started thinking through ways to make the move back to Gmail more tolerable months ago, when Google first announced Inbox's pending exit. I've been refining those systems little by little ever since, and at this point, I've got a pretty solid setup for anyone who loves Inbox's innovations and doesn't want to let all those concepts go. Consider this your guide to moving on — to going from Inbox back to Gmail with as little lost as possible (other than a piece of your heart). Gentle tear-wiping aside, the first thing you'll want to do is tackle your reminders — because many of those live solely within Inbox and will no longer be available once the app disappears. Start by opening the Snoozed tab in Inbox's main menu and seeing what shows up. Any emails that are snoozed will carry over to Gmail and automatically appear at the right time there. But any reminders will either appear only as temporary, easily overlooked notifications, if they were set outside of Inbox — or won't appear at all, if they were set from within the app. The result is a confusing and unpredictable mess with plenty of risk for missing something important. That's why I'd manually copy every pending reminder and then paste it in as a new event in Google Calendar. Give it a color that you'll use only for reminders, and start it with the words "Remember to." Once you've copied it over and saved it in Calendar, delete it from Inbox so you'll know it's done. Next, follow the steps I outlined in part II of this Inbox feature re-creation guide. The initial setup is slightly complicated, but the results are spectacular: Any Calendar event starting with the phrase "Remember to" will automatically appear as a notification on your phone when its time arrives — just like any other calendar event or reminder — but it'll also appear as a specially formatted item within your Gmail inbox, where it'll remain until you actively dismiss it, just like what you're used to with Inbox. No more missing important stuff. And if you want to be able to edit reminders in your inbox or attach reminders onto specific emails, there are workarounds for doing both of those things within that aforementioned story, too. See parts III and IV, respectively. Another Inbox feature being lost in the transition is the service's ability to save articles and other web pages directly into your inbox, where they can then be snoozed or searched for just like any other item. Any articles you've saved will be lost once Inbox goes away, and Gmail has no equivalent system for saving new pages. Here's the fix: First, go into Inbox now and open the Saved section within its main menu. Open every saved article you still want to hang onto, and then think carefully about where you want to put it. You could always move everything into a standalone service like Pocket (which has both an Android app and a Chrome extension for simple on-the-fly saving). You could even just save pages directly within Chrome, both on the desktop and from Android. For me, though, what made Inbox's article saving feature so exceptional was the fact that it brought articles directly into my inbox — where I'm actually likely to see them and deal with them (or snooze them to a day and time when I'll be able to do so). Standalone article-saving tools, in contrast, usually end up turning into dust-covered collections of things I want to read but never get around to revisiting. If you want to follow the Inbox model and bring articles directly into your inbox in Gmail, a service called Email This is exactly what you need. It actually even improves on the Inbox arrangement by bringing not only links but nicely formatted versions of entire articles into your inbox so you can read them — and search for them later, even — right in that one central spot. It's super-handy, and I've been using it regularly in the months since I made my transition back to Gmail. I dive deeper into the specifics of my setup — including how I organize saved articles and make them stand out from regular emails — in part I of that feature re-creation guide. Coming back from Inbox, the Gmail desktop interface can feel incredibly overwhelming. There's just so much going on and so little in the way of effective organization compared to the minimalist and sensible system you've grown accustomed to using in Inbox. Well, don't panic: First and foremost, you need to think about how you want your inbox to be structured. While earlier reports had suggested that Inbox's Bundles system would be making its way into Gmail, a Google spokesperson tells me it's the trip bundling, specifically, that's on the development roadmap (though not with any specific time frame attached). That means when it comes to general inbox organization, you're gonna have to settle on a next-best alternative. My suggestion is to try Gmail's tabbed inbox option. It isn't Bundles, by any means — but it's in the same general ballpark and is a reasonably decent second-choice option. And with a little bit of tweaking, it can really become quite usable. Activate the tabbed inbox, if it isn't already selected, by hovering over the word "Inbox" in Gmail's left-side panel (on the desktop) and then clicking the downward-facing arrow and selecting "Default." The tabbed inbox supports up to five auto-categorized sections: Primary, Social, Promotions, Updates, and Forums. Take a look at what kinds of messages are being put into each section, and think carefully about which of them is actually beneficial for you to have. Personally, I found that by disabling Social and Forums, I got a more manageable inbox. I don't get that many emails that belong to either of those categories, and it makes more sense for me to have those messages land in either Promotions or Updates, as appropriate, and condense the number of places I have to look during the day. You can adjust your own section lineup by moseying into the "Inbox" area of Gmail's settings. There, you can simply uncheck any section you don't want to be present — then click the "Save Changes" button and see how it affects your mail sorting. Remember, too, that you can teach Gmail where certain types of emails belong by manually moving them when they land in the wrong category (or by creating filters, if you have super-specific parameters and want to see immediate change). In that same area of Gmail's settings, you might want to consider clicking the "No markers" option under the "Importance markers" heading. That'll get rid of those yellow arrow thingies that add a lot of visual clutter into the desktop interface without adding much meaningful value. And speaking of clutter and interface optimization, look back to this guide for several worthwhile steps toward improving Gmail's desktop interface. It has some incredibly helpful tips on simplifying the UI and giving it some Inbox-reminiscent shortcuts — things that have made a tremendous difference in my own adjustment back to the Gmail environment. UPDATE (4/1/19): If you really want an Inbox-like vibe in Gmail, check out this quick tip for bringing the actual Inbox interface into Gmail (yes, really — not an April Fools' joke!) — and/or take a look at how the actual creator of Inbox redesigned Gmail to bring the same minimalist principles into its environment. Don't forget that with Inbox out of the picture, it'll be up to you to configure Gmail to handle notifications in whatever way you want. The Gmail Android app actually now has a "high-priority only" notification mode modeled off of Inbox that attempts to detect which incoming messages are truly important and then notify you only of those missives. Or you can take things a step further and set up your own custom Gmail notifications based on what messages you know demand immediate attention. Either way, it's something to think through before you make the switch. Gmail's Android app does some annoying things by default, but with a few minutes of configuration, you can make it far more pleasant to use. You can also enable some Inbox-like shortcuts, including the ever-useful swipe-left-to-snooze gesture. I put together a list of recommendations here. If you rely on Inbox to organize your travel, you'll be sad to know that Gmail has no such feature as of yet (though remember, Google says that is coming — at some point). For now, you'll just have to grab the standalone Google Trips app to get the same info, still automatically compiled from your emails and organized into trip-based bundles. It's available only as a mobile app, oddly enough — but if you have a Chromebook that runs Android apps, that isn't a limitation that'll affect you. If all of this still leaves you feeling "meh," you've got one other option to mull over: You can ditch Gmail, as an interface, and go with a third-party service that uses Gmail as its backbone instead. I explored a few intriguing options a while back, and the one that stands out the most for the Inbox faithful is a little somethin' called June. June is by no means an Inbox clone, but it's built on many of the same principles and offers some comfortingly familiar features. At its core, June separates your emails into a main inbox list — for higher-priority and personal messages — and then a tucked-away feed that holds everything else. The feed can be viewed as a single list or broken down into categories like news, finance, purchases, calendar invites, and trips. You can even pin particularly important messages and then view them in a separate section, a la Inbox. And you can sweep away entire sections of your feed with a single press of the checkmark-toting "Clear" button. That is on the roadmap for 2019, though, I'm told — so if you want an Inbox-inspired service on the desktop and can live without a phone-based counterpart for the moment, it could be worth considering. The service is free (likely with premium add-on features coming into the equation at some point), and the company says it never sells or shares any email data. Whatever path you decide to pursue, know that the post-Inbox life doesn't have to be one of loneliness and despair. In fact, crazy as it may sound, I'm actually all-around happier with my email setup now than I was before. I took the ideas Inbox introduced to me and found ways to make them live on in my newly enhanced Gmail setup, often with twists that make them even more useful for me — like being able to create reminders with a single keyboard shortcut from anywhere in Chrome (hello, step 1!) or being able to read and find entire saved articles right in my inbox (ahoy, step 2!). I've been on the other side of this breakup for nearly four months now, and lemme tell ya: Once you get your bearings, it really isn't so bad. You will learn to love (email) again. We'll get through this together, you and me. I promise.